I recently came across one feature of Django that seemed pretty useful for one off projects and customizations and was startled because it's one of Django's least mentioned features. In fact, I've been using Django at work for over 5 years now and didn't hear of it until this last week. This feature is the manage.py command inspectdb which inspects the tables in an existing database and creates Python code defining the Django models for those tables. We had a use case at work where we had a database table that was not managed as a Django model, but we wanted to create tests interacting with that table. The solution was to use inspectdb to create a models.py file in a test application and add that application to INSTALLED_APPS when running tests. That way the table is created via syncdb when the tests are run, and we can use the model to create/check test data. One of my other co-workers mentioned that inspectdb could be used to create Django models for an entirely different system not written in Python, say WordPress, and very easily create Django admin for that system. So I decided to try just that. I would create a WordPress database, use inspectdb on that database, and create a very simple alternative admin for WordPress. 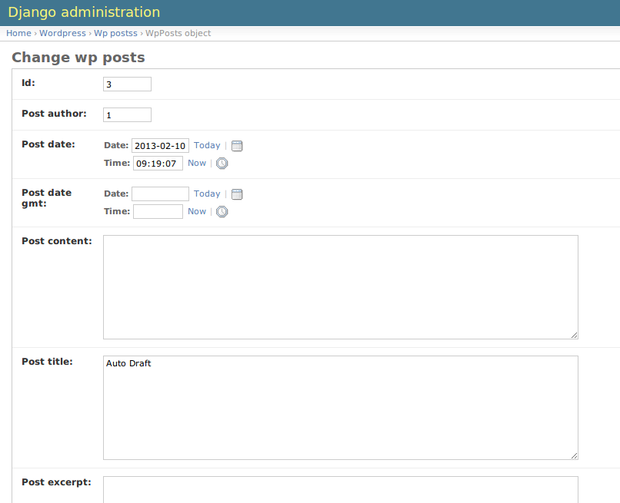 First we are going to create a Django project for our WordPress admin. Django 1.5 will be released soon but this project is going to use 1.4, which is the latest stable version as of this writing. Next, let's edit the settings.py. We'll need to add settings for how to connect to the database. You'll need to set this correctly so that Django can connect to your wordpress database. We will be putting the Django tables that we need in a separate database so you'll need to create that database separately. Now, here's the fun part. We're going to use the real WordPress database to create our Django models. comment_id = models.BigIntegerField(primary_key=True, db_column='comment_ID') # Field name made lowercase. comment_post_id = models.BigIntegerField(db_column='comment_post_ID') # Field name made lowercase. comment_author_ip = models.CharField(max_length=300, db_column='comment_author_IP') # Field name made lowercase. "Point all operations on wordpress models to 'wordpress'"
"Allow any relation if a model in wordpress is involved"
"We don't create the wordpress tables via Django." Replace the appropriate mysql options with those for your database. wordpress.wpposts: "id": You can't use "id" as a field name, because each model automatically gets an "id" field if none of the fields have primary_key=True. You need to either remove/rename your "id" field or add primary_key=True to a field. wordpress.wpterms: "slug": CharField cannot have a "max_length" greater than 255 when using "unique=True". id = models.BigIntegerField(db_column='ID', primary_key=True) # Field name made lowercase. The WpTerms model's slug field can't have a unique=True index with a field larger than 255 in Django. Since we aren't really doing that much with the field we can simply remove the unique keyword. You'll need to login to view the admin. One thing to note is that for the Django admin we authenticate with the Django user we created when running syncdb for the first time and not WordPress' users. I hope you realized some of the interesting things you can do with the inspectdb command. We didn't really have to use WordPress. We could just as easily have used any database application, like Redmine or Bugzilla. 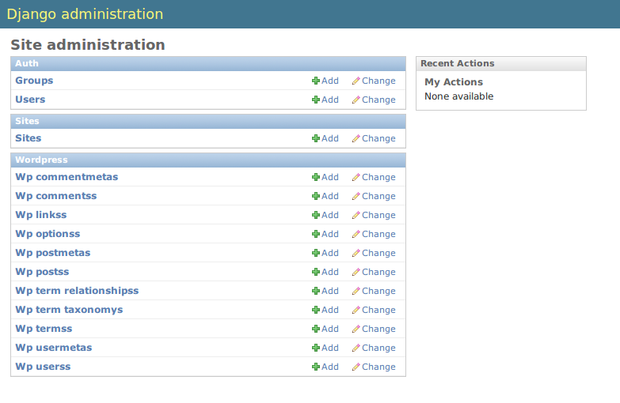 There's also an endless amount of customization you could do using the Django admin to provide a richer experience. You can get started by reading the Django docs for the admin: The Django admin site. Have fun!